Frog and Mouse lived across a stream. Mouse agreed to be taken across to visit Frog. Frog gets greedy and dives; Mouse screams. Kite hears and takes both. When fools fight others run away with the prize. The Frog had a plan. He tied the Mouse’s leg to his own with a tough reed. Then into the pond he jumped, dragging his foolish companion with him. A Mouse and a Frog had lived some time in intimacy together, and the Frog had often visited the Mouse’s quarters and been welcome to a share of his store. The Frog invited the Mouse to his house in return; but as this was across the stream, the Mouse, alleging that he could not swim , had hitherto declined to go. The Frog, however, one day pressed him so much, offering at the same time to conduct him safely across, that the Mouse consented. One of the fore-feet of the Mouse was accordingly bound to one of the hind-legs of the Frog by a stout blade of grass, and the friends set off to cross the stream. When about half way across, it treacherously entered the Frog’s head to try to drown the Mouse. He thought that by that means he should have undivided possession of the latter’s stock of provisions. 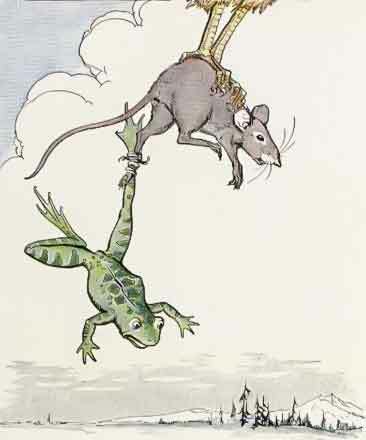 The Frog made for the bottom of the stream, but the struggles and cries of the Mouse attracted the attention of a Kite who was sailing above in the air. He descended and caught up the Mouse. The Frog, being tied to the Mouse, shared the same fate, and was justly punished for his treachery.